Following our initial analysis of the burden of hospitalisation in Parkinson's Disease, we have recently reviewed the data to understand whether any improvements have been made in reducing avoidable hospital admissions. 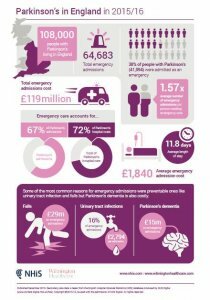 If we could put of the 108,000 people living with Parkinson’s in England data taken from Hospital Episode Statistics has shown that in 2016 there were almost 64,700 hospital admissions for people with the condition and 38% of these were admitted as an emergency (41,094 people). The main reasons for admission was falls, urinary tract infections and Parkinson’s dementia with an average admission length of 11.8 days at a cost of £1,840. Much of the £29 million spent on falls might have been preventable with the right community support in place. We have produced a revised infographic to illustrate the key highlights of our findings. Sadly these problems highlighted previously by Wilmington Healthcare in 2014 are not improving.